Weighing widening roads against providing better alternatives to sitting in traffic is a key focus for D.C., Maryland and Virginia's transportation bosses. WASHINGTON — Weighing widening roads against providing better alternatives to sitting in traffic is a key focus for D.C., Maryland and Virginia’s transportation bosses. 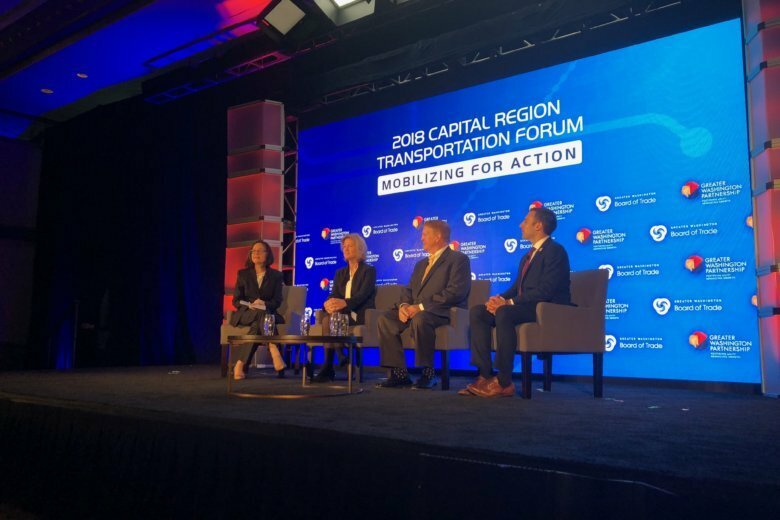 But, Maryland Transportation Secretary Pete Rahn said Tuesday at a panel hosted by the Greater Washington Partnership that not every place in the region can have the option of a train, bus, bike lane or walking path. “I think we have to recognize that while there is a desire to provide multiple options of transportation modes to everyone, that that’s not realistic in non-really heavily urbanized areas. I think that suburban becomes a little more difficult and obviously rural becomes extremely difficult to provide this public transportation system to everyone,” Rahn said. He believes more private services such as Uber and Lyft that are currently subsidized by venture capital are the way of the future in most places. “It’s not going to be addressed by just highways, it’s not going to be addressed by just transit or just bicycles or pedestrian … we have to come up with solutions that are going to utilize all of those modes, all of those utilities, in the most appropriate way,” Rahn added. D.C. is trying to provide all of those options in the city, said District Department of Transportation Director Jeff Marootian. “We’ve spent significant resources and planning to rebuild and reinvest in our infrastructure, something that has been failing for a long time,” Marootian said. The city is working on key rail expansion for the region with a study of expanding capacity over the Long Bridge, extending the streetcar line to make it more useful to commuters, fixing failing bridges and repaving roads. “Everything that we’re talking about, whether it’s autonomous and connected vehicles, whether it’s eliminating traffic fatalities, all requires that our infrastructure be in a state of good repair,” Marootian said. The city is also trying to embrace new technologies, such as partially autonomous or connected cars and dockless bikes or scooters. Valentine saw that mix as a necessary focus, given all of the traffic the region faces today. “That is the future, and so that’s where all those investments are going from rail, transit, commuter rail,” she said. Virginia is also building toll lanes along Interstate 66 and an extension of the I-95 Express Lanes over coming years. “We’re moving now not only goods and people, we’re actually moving data and information as we move into automated systems and autonomous systems and express lanes,” Valentine said. Rahn praised Virginia’s toll lanes, and said Maryland’s plans for similar lanes around the Capital Beltway and part of I-270 is an example of how he hopes to address traffic issues. “I believe that congestion is the enemy of all of us when it comes to both our economic viability and our quality of life,” Rahn said. He alluded to concerns from people living along the highways that the projects will simply lead to a roadway expansion that adds traffic and pollution and takes homes and businesses. “This entire region has very sensitive assets along all of these routes that we need to address, and so we have to be responsible in how we deal with those neighbors and how do we still get people moving,” Rahn said.